Each year, Regent University celebrates a week of prayer alongside the Christian Broadcasting Network. From Monday, September 18, to Friday, September 22, Christian leaders from around the nation spoke during the week of chapel services dedicated to praying for CBN’s partners and friends. Special guests included author and speaker, Max Lucado; Dove Award-winning musical artist Charlie Daniels; Johnathan Cahn from Hope of the World ministries; and Regent founder, chancellor and CEO, Dr. M.G. “Pat” Robertson. 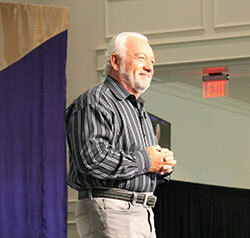 Wednesday, September 20, Regent’s combined University Chapel service featured worship artist and author Paul Wilbur. “I count it a real privilege to stand in front of you, and I believe God has appointed us for such a time as this,” said Wilbur. Wilbur said that he was in the middle of a worship song when he heard the Holy Spirit intervene in his life, prompting him to live with “no more declarations without demonstrations” – meaning believers should show, not tell, about their lives as Christians. “We’re to be known as an extension of Heaven into our communities,” said Wilbur. In addition to demonstrating the love of Christ, Wilbur encouraged his audience to focus on three words when it comes to living Godly lives: align, restore and advance. Aligning your dreams with God’s plan is the first step to pursuing a Christ-filled life, according to Wilbur.